There has been some confusion about which pyramids can be used for the Agnihotra process, as there are some pyramids on the market which differ in size, shape and/or material from the Agnihotra pyramids which we have been using for decades now. As this Agnihotra copper pyramid is an essential element of Agnihotra, this is an important subject. Let us look into it in more detail. First we have compiled some of the statements from ancient Vedic knowledge about the role of this copper pyramid in the Agnihotra process, as given in the writings of Shree Vasant Paranjpe. –Homa Therapy, Our Last Chance, Fivefold Path, Inc., 1989, p.14. – Agnihotra flier, Fivefold Path, Inc.
– Homa Therapy, Our Last Chance, Fivefold Path Publications, 2005, chapter 12, 3rd paragraph. Some of these statements from the ancient Science of Vedas are still difficult to understand in terms of modern science. But what we do understand is that the Agnihotra pyramid is a scientific tool which works on sound (vibration) and resonance. Important features of this tool which affect production and resonance of sound are size, shape, and material. For sound, the size of the vibrating parts of an instrument is crucial; e.g. if you change the length of the strings of a guitar by just a few centimeters, the sound generated would be changed. Similarly with the Agnihotra pyramid, if you change the size, the resulting vibrations would also change and thus affect the healing properties of this Agnihotra fire. The specific size and shape of our Agnihotra pyramid were not available in the market (although there are pyramids of different sizes and shapes used in other traditional havans in India). Shree Gajanan Maharaj told one disciple to prepare a copper pyramid of this specific size and shape, and all the pyramids which are sold by Certified Homa Therapy Centres use these specifications. It was interesting to hear what one senior scientist from Eastern Europe said when he examined the Agnihotra pyramid the first time. He was very much astonished and mentioned that only a genius could have designed this Agnihotra pyramid. He found so many mathematically astonishing relations in the pyramid, such as several ratios containing pi, and e (the basis of natural logarithms; next to pi, a fundamentally important mathematical constant). From this description it is clear that changing the shape (the angles of the sides, the proportions of the three steps, the edge) would change the way sound is emitted from the steps of the different sides. Also this standing wave could be affected. One Eastern European physicist mentioned that if you keep the Agnihotra pyramid at a certain height there would be a sound sent to all of your seven chakras: from the bottom of the pyramid your heart chakra would be reached, from the three steps of the side next to you your three lower chakras, and from the opposite side of the pyramid the three upper chakras. Many years ago someone in Poland had the idea to put a raised dot on one side of the pyramid, which makes it easier to always keep the pyramid facing the same direction (which we now need for installing resonance systems). Only after we showed this pyramid to Shree Gajanan Maharaj (who at that time still was in the physical body) and got His approval, we continued with the production. 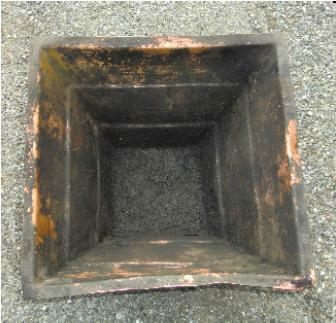 Recently some pyramids came on the market with embossed letters on the edge (rim). This will definitely interfere with the functioning of the Agnihotra pyramid as a scientific tool. These pyramids cannot be used for Agnihotra. – Homa Therapy, Our Last Chance, Fivefold Path, Inc., 1989, p.13. One physicist stated that the crystal structure of copper is in the shape of a pyramid; therefore, we have a special resonance which will be disturbed if copper is adulterated. 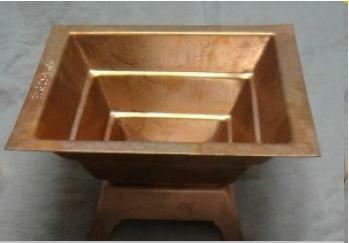 Thus, it is important that only pure copper is used for the production of copper pyramids. 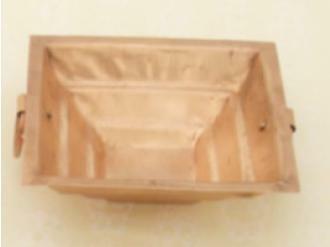 Best is electrolytic quality virgin copper made from copper ore, not from recycled material. 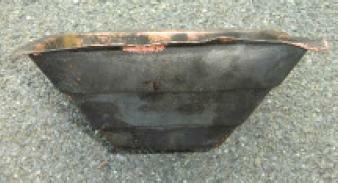 Recycled copper may contain traces of all kinds of other materials and of course the vibrations of the previous usage. As prices of copper have more than tripled in the last eight years it is tempting for producers who see the production of pyramids just as business to add some cheaper metals to copper in order to increase profits. This is not so easy to see, but these other metals interfere with the vibrational effects of copper. 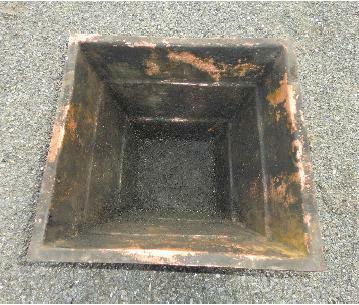 Do not bang or scrape the pyramid, as it will interfere with the crystalline structure of the copper, thereby disrupting the Agnihotra process. But even if you take proper care it happens that after years of performing Agnihotra pyramids show some signs of long usage. The main thing is that the shape has to be correct. Sometimes it happens that some cracks or holes develop at the sides of Agnihotra pyramids. These pyramids cannot be used for Homa fires any more. But instead of throwing them away one could use them as pots for plants or bury them in the garden, as they still contain the vibration of all the Homas performed in them. Sometimes the shape of the pyramid changes; e.g. the edges or sides are no longer flat but become undulated. As the shape of our Agnihotra pyramid is essential, these pyramids also should not be used any longer, but in this case you can repair the damage. One way is to send it back to the producer who can easily press it back to shape again. Or, if you have access to a stack of twenty new Agnihotra pyramids, you can put the damaged pyramid in the middle (ten below, ten above)and then put pressure from above. (See top right photo.) This will help to get the used pyramid in shape again. Similarly, when an Agnihotra pyramid falls on the ground and a corner is bent, you can either use the same method, or you can put the edge with the bent corner on some hard wood and then exert some pressure so that it will be even again. The main thing is that when you look along the top edge and along the sides, they must be straight. Also when looking from above into the pyramid, all sides should be square to each other (90 degrees). How to be sure that a pyramid you buy is of correct size, shape, and material for Agnihotra? The best way is to buy only from Homa centres run by certified Homa Therapy teachers. There, the main focus is to teach Homa Therapy in its pure form and support others to practise it. No compromise in quality of the materials will be made there, as Homa Therapy is the first priority, not profit. A list of such centres can be found at www.agnihotra.org and www.homatherapy.org. Also, you can recognize these centres by the offical Homa Therapy logo. It is a registered trademark which, by law, can only be used by official Homa Therapy centers.